The above info came from Blake Turner, and was edited by yours truly (contact me). Based on the classic 1949 manga by Osamu Tezuka, Metropolis takes place in a vast and futuristic city/state, where Humans and robots are segregated and separated by level and position. 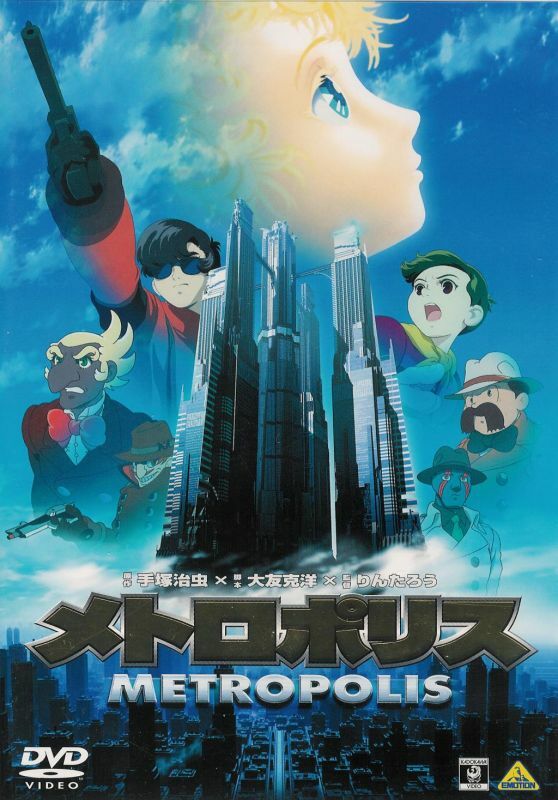 Detective Shunsaku Ban and his assistant Ken-ichi visit Metropolis during the opening of the Ziggurat (which is a massive series of towers in the center of the city), on a case to hunt down and capture the freelance scientist Dr. Laughton. But the case leads to something much bigger and Duke Red, the powerful leader in charge of the city, is plotting to take over the world with the Ziggurat and the help of a robotic girl named Tima (who was modeled after his deceased daughter). However, his adopted sun, Rock, has an extreme hatred of robots, and murders Laughton in an attempt to destroy Tima. Tima escapes and runs into Ken-ichii, who gets separated from Shunsaku at Laughton's lab. In the vast and beautiful future city of Metropolis, deep within its depths, a caring inventor creates Tima. The inventor sadly dies and Tima wanders through the city, teaming up with Ken-ichi, son of the Japanese ambassodor. Together, they flee from the clucthes of the evil Duke Red and his teenage son, Rock. Tima, it turns out, is soon to be the ruler of the Earth, but forfeits her eternal throne for the sake of her friend, Ken-ichi. The above description came from Brandon P, and was edited by yours truly (contact me).